Paddy Power are one of the giants of mobile gaming. Their casino and bookmaker apps are wildly popular in the British Isles, and for good reason. Bet in-play, live scores, live horse racing videos, coupons and much more. Google Android is now the world's most popular smartphone operating system, so it stand to reason that online bookmakers are falling over themselves to produce the best possible Android betting apps in order to attract new customers. If you own an Android device like a Samsung Galaxy or Sony Xperia, you will have access to the most technologically advanced wagering apps available today. Gone are the days when mobile bookmaker apps were little more than a miniature website that let you place bets on a limited number of major sporting events. 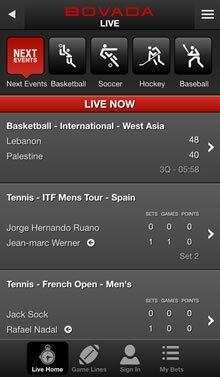 Today's Android betting apps allow users to watch their favorite sport live on their handset for free. They are also a one stop shop for live scores, results, league tables, upcoming fixtures, statistics, team news and much more. Sports bettors in the United States are now also well catered for with a wide range of cutting edge mobile sportsbooks. Automatic Alerts - Never miss another profitable betting opportunity again by setting up alerts on your smartphone that will notify you when your favorite team, horse or jockey are competing again. Watch Live Sports & Horse Racing - Place a £1 bet and watch any horse race live on your Android. Everyone with a Bet365 account can watch soccer, tennis, basketball and dozens of other major sports for free on their phones. In-Play Betting - Live betting is now available on thousands of sporting occasions every week. Since Bet365 are exclusively an online bookmakers so all their focus and attention goes into providing the best online and mobile service possible. 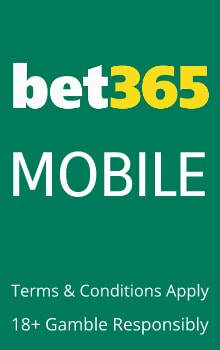 This show in the latest Bet365 Android app which is streets ahead of the competition. The apps looks great, is extremely responsive and easy to navigate, and offers features you won't find at any other mobile bookmakers. For instance, while most bookmakers offer live streaming video of horse races, Bet365 also streams a wide range of other sports, such as soccer, basketball, cricket, boxing, rugby and tennis to both their iOS and Android tablet and smartphone apps. Bovada (known as Bodog in Canada) is the most advanced United States friendly betting app on the market today. From the top menu of the app users have quick access to sports and horse race betting, mobile casino games and even Texas Hold'em ring games and poker tournaments. The home screen displays the most popular events so you can quickly place a bet on any upcoming MLB, NBA or NHL games. Parlay (accumulator) and Live In-Play betting is also offered via the Carbon Mobile app. While the Bovada app does not feature a full horse racing section, you can bet on major US and international racing events like the Breeders Cup, the English Grand National and the Kentucky Derby. BONUS: Get a free bet bonus of up to $250 dollars instantly thanks to Bovada's 50% new player bonus. William Hill are one of the oldest bookmakers in the world and the largest in the U.K. Their Android app is excellent, offering a wide range of exclusive betting offers you won't find on their website or in their betting shops. The app features a "Top Bets" section which shows you where the money is going at any point in time so you can get in on the action. 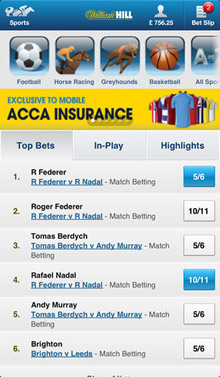 The William Hill Android app is also great if you want up-to-the-minute scores and results across all sports. The horse racing section carries independent racing information and tipping advice from the Racing Post. The racing section also highlights the top 10 backed horses, allowing to quickly place bets on the most fancied horses. BONUS: William Hill offer a wide range of free bet and cashback offers. For example, if you place a football accumulator and you get only one result wrong, William Hill will refund your wager as a free bet. Also, if you horse wins by more than 10 lengths, they add 10% to your winnings. If the horse wins my 20 lengths, you walk away with an extra 20% etc. I can't find my favorite bookmaker app in Google Play? How do I download it to my phone? Unfortunately Google do not permit any type of real money gambling apps in Google Play. Their content policy states that they do not "allow content or services that facilitate online gambling, including but not limited to, online casinos, sports betting and lotteries, or games of skill that offer prizes of cash or other value." For Android devices, many gambling companies allow you to download their apps directly from their websites in the form of an APK file. Other provide web apps that can be accessed by simply browsing to their websites from your tablet or phones. What should I be looking for in a Android bookmaker app? That depends largely on what type of sport you are interested in. If you are a fan of horse racing, you should ensure that your bookmaker broadcasts live streams of individual races to their Android app. Sports fans may want to choose a betting app that provides live scores, free bet offers, team stats, independent betting tips, news and audio commentary. Is is safe to use and Android bookmaker app in a WiFi zone? Yes, it is perfectly safe to use any of our recommended sports betting sites on a WiFi connection. Even though you may be using a free and open WiFi network in a cafe or bar, the information transmitted between your phone and the bookmakers server is encrypted. This creates a secure channel for your personal and financial information to flow through. I live in the United States of America? Can I place sports bets from my Android or iPhone? YES!!! Even though many of the big European companies do not accept punters from the US, a number of U.S. friendly bookmakers have developed mobile sites that can be used on any internet-enabled handset, including iOS, Android, BlackBerry and Windows Phone devices. A full list can be found in our U.S. Betting Apps section. My Android smartphone is old? Will I still be able to download and use these bookmaker apps? Yes, definitely. Not everyone has the latest Samsung Galaxy, Motorola Droid, LG Optimus or HTC One model but this should not affect your ability to use any of the apps featured on this website. Since every mobile bookmaker offers web apps that can be accessed via your phones browser, it doesn't matter how old your phone is or whether it is running Eclair, Froyo, Gingerbread, Honeycomb, Ice Cream, Jelly Bean or Kit Kat OS versions. Nowadays, Android mobile devices like smartphones are among the most popular tools used for online sports betting. Just like with other forms of wager-based online entertainment, sports betting requires you to use site-specific apps most of the time – but if you don’t really feel like installing any specialized software on your device, you’re still going to find plenty of browser-based clients optimized for Android phones and tablets. It’s also important to point out that the sports betting companies are expected to devote more attention to mobile users, as the market share of Android-based apps has been steadily growing over the past few years. Obviously, you could say that this situation is simply a result of Android mobile devices becoming more and more popular with each passing year, but that would really be only half of the truth. The other reason for the popularity of such apps is the fact that unlike online poker or even casino games, they don’t require quick input from the player. This makes them perfectly suited for smartphone users, as there’s little to no reason to limit their functionality when compared with desktop based clients – the game isn’t about performing the right action within a short time limit, and all about making the right sports predictions. Consequently, it doesn’t matter whether it’s real life soccer or even fantasy football – your success depends solely on your brainpower, planning and knowledge. At this point, you’re probably asking yourself whether wagering your money at a virtual, mobile bookmaker is actually safe. Fortunately, the answer is a resounding yes, as most of the bookmaking sites available for Android users actually have years of experience when it comes to hosting online sports betting services. After all, the market has existed around desktop computers for years, so when it comes to handling your money, security and customer service, there’s absolutely no reason not to expect the same high standards desktop-based online sports betting enthusiasts already got used to. Another really cool thing about mobile bookmakers is the vast selection of sports available. Aside from obvious picks like soccer and American football (both NFL & NCAA), they include tennis, rugby, cricket, auto and motor racing, golf, NBA & NCAA college basketball, boxing as well as mixed martial arts. Basically, no matter what sports you enjoy, if you’re enthusiastic about your hobby enough to be willing bet on your favorite teams, odds are high you’re going to be able to do so using your Android smartphone. Actually, plenty of websites offer live betting and live streaming, which further enhances the experience and allows you to make online sports betting a more social activity – after all, you probably wouldn’t bring your computer to a pub to watch a soccer game, right? As you’d expect from such a massive market with such an impressive potential for growth, the number of operators to choose from can get overwhelming at times. While most of them offer high-quality sports betting services, if you’re new to the world of mobile bookmakers, you’re probably seeking guidance here. The reviews we’ve prepared on this site are going to outline the major pros and cons of each site - but like in the actual game, in the end the choice is always yours.